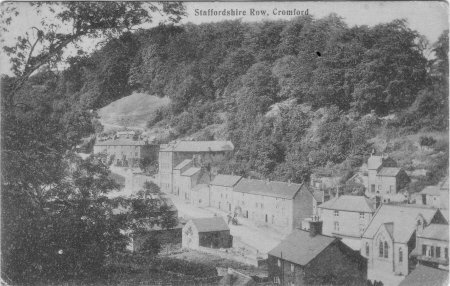 Staffordshire Row is a group of 8 three-storey gritstone houses on Water Lane (numbers 30-46, listed Grade II) in Cromford (see lower centre of the photo). It is thought they were built about 1720 to house workers from Staffordshire to work in a mill smelting Zinc Oxides, by a firm from Cheadle. The smelter was replaced about 1780 with a corn mill, built by Richard Arkwright to supply Cromford. The corn mill was driven by two waterwheels, remains of which can still be seen. The houses can be seen in the Census in 1901 and 1871. At other times the houses are listed under Scarthin.